WPI Strategy’s recently commissioned YouGov poll has appeared in the widely read Times Red Box newsletter. 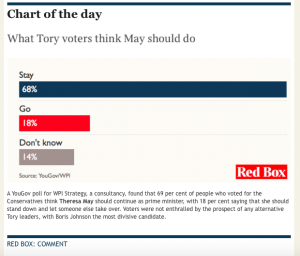 The poll asked Conservative voters whether Prime Minister Theresa May should stay or depart her role at this present time. The poll appeared in several other notable news publications, including The Daily Express, The Spectator and The Mirror.